Point Blank Range is now hosting a Steel Challenge for all ages. You can shoot Pistol, Rifle, or both. You can shoot as many times as you like or as many times as needed to keep your name at the top of the leader board. .22 rim-fire pistol or rifle with iron sights only – this will be provided by PBR. 4 steel plates and one stop plate. 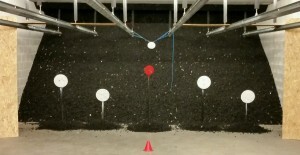 Plates must be shot in order with stop plate being last. Prizes will be awarded to the top Open shooter, Female shooter, and Junior Shooter (less than 18 years of age) each day.